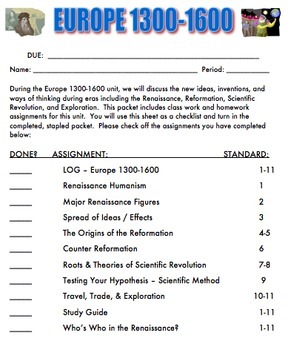 Renaissance Europe Student Packet & PowerPoints - Renaissance, Reformation, etc. 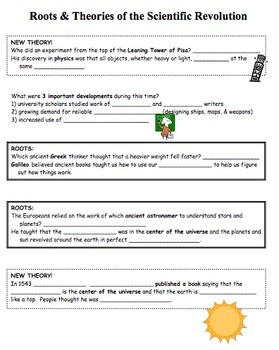 This product contains a 30-page student interactive packet and 4 informative PowerPoint presentations for students to learn about Europe during the time period of 1400-1600, including important eras such as the Renaissance, Reformation, Scientific Revolution, and the Age of Exploration. I have also included 4 PowerPoint presentations that go along with several notesheets in this packet: 1) Renaissance Humanism PowerPoint, 2) Renaissance Art – Major Renaissance Figures PowerPoint, 3) Reformation Origins PowerPoint, and 4) Counter Reformation PowerPoint. 1) The 10-slide "Renaissance Humanism" PowerPoint teaches students about the beginnings of the Renaissance in Florence, Italy, the emphasis on humanism, how ideas spread, and allows students to think of "Renaissance men and women" today, including themselves. 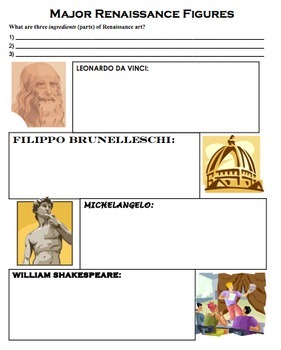 2) The 7-slide "Renaissance Art" PowerPoint teaches students the main ideas about Renaissance art and artists. It includes the "ingredients" that allowed the art to happen, the main themes of Renaissance art, and describes the uniqueness of art from Renaissance figures such as Leonardo da Vinci, Michelangelo, Filippo Brunelleschi, and William Shakespeare. 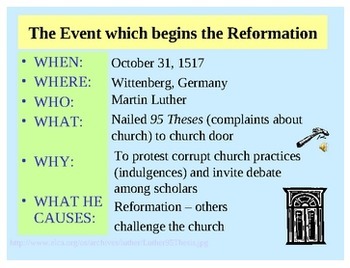 3) The 15-slide "Reformation" PowerPoint teaches students the origins and effects of the Reformation in Europe. Students learn what led to the Reformation, how it began with Martin Luther's 95 Theses, and the actions and teachings of Reformation figures such as Martin Luther and John Calvin. 4) The 8-slide detailed "Counter Reformation" PowerPoint teaches students the definition of the Counter Reformation, including 4 main parts: Inquisition, Index, the Council of Trent, and the Reforming Orders. At the end, students are challenged to think how a Catholic and a Protestant would react to each of these events. With this product, you will have all you need to teach the important Renaissance era in Europe! Have fun!